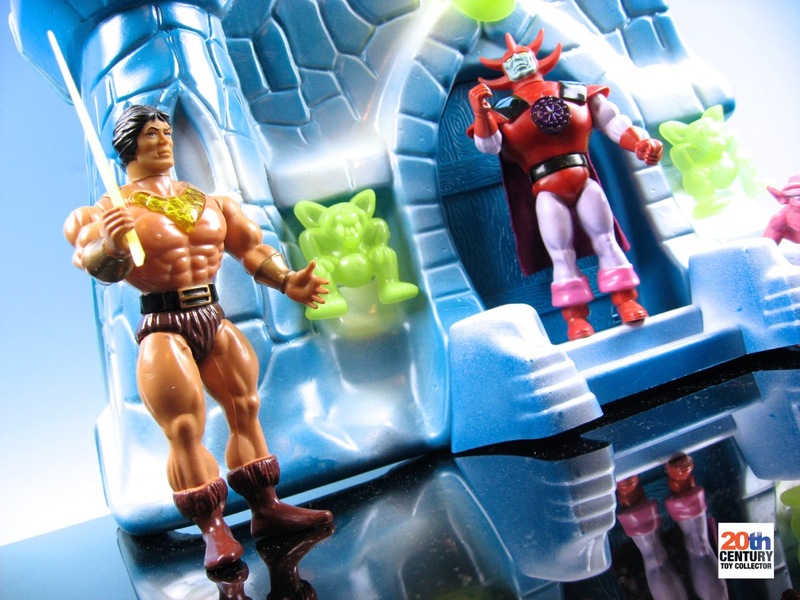 Nearly every 1980′s toy line had that one item that was on top of every kid’s wish list. Most often that would be some kind of playset like G.I. 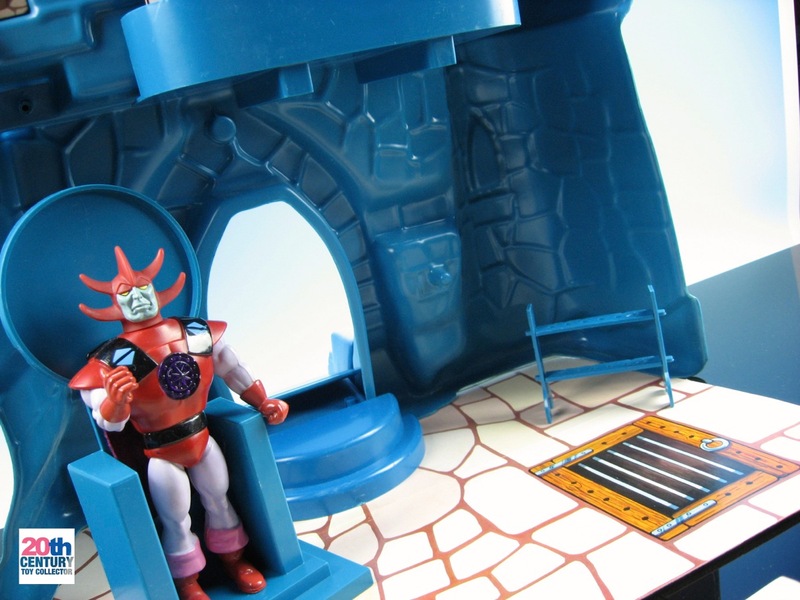 Joe’s “USS Flagg” carrier or Masters of the Universe’s “Eternia” playset. 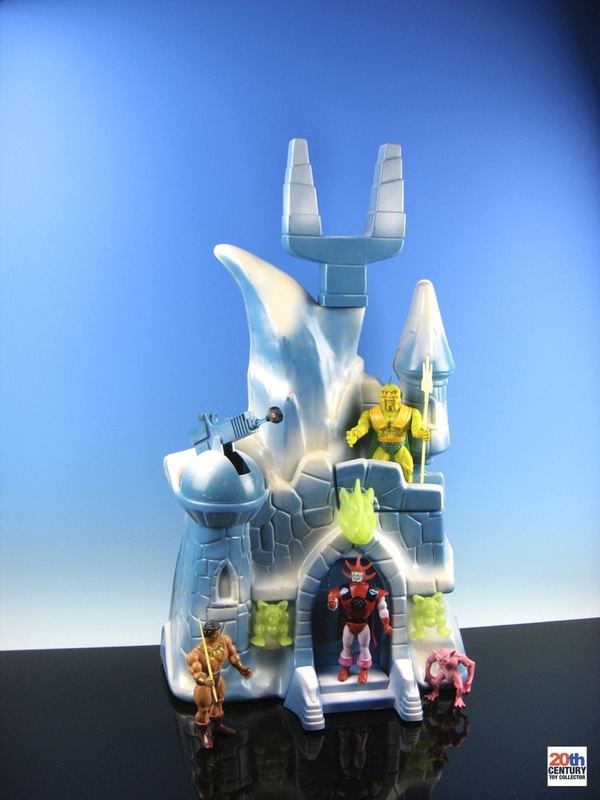 Today I would like to discuss another fine example of such playset über coolness, which is a playset from Galoob’s Blackstar toy line: The Ice Castle!!! 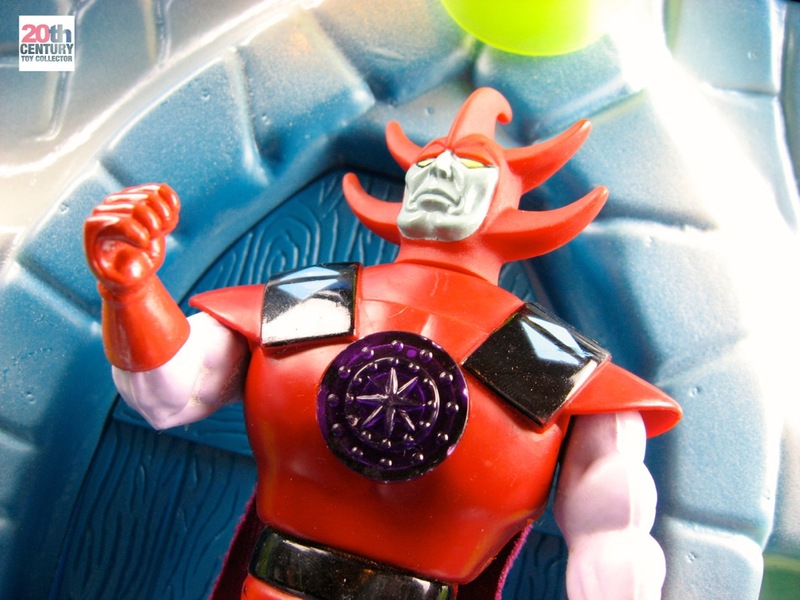 It is by far the coolest item of the Blackstar toy line and it’s really tough to find. There are some photos online of the Ice Castle, but nowhere have I ever found a very detailed look at all the parts it consists of and what it looks like assembled from the inside. If you’re interested in a detailed look at the Ice Castle, you’ve come to the right place. Let’s go! 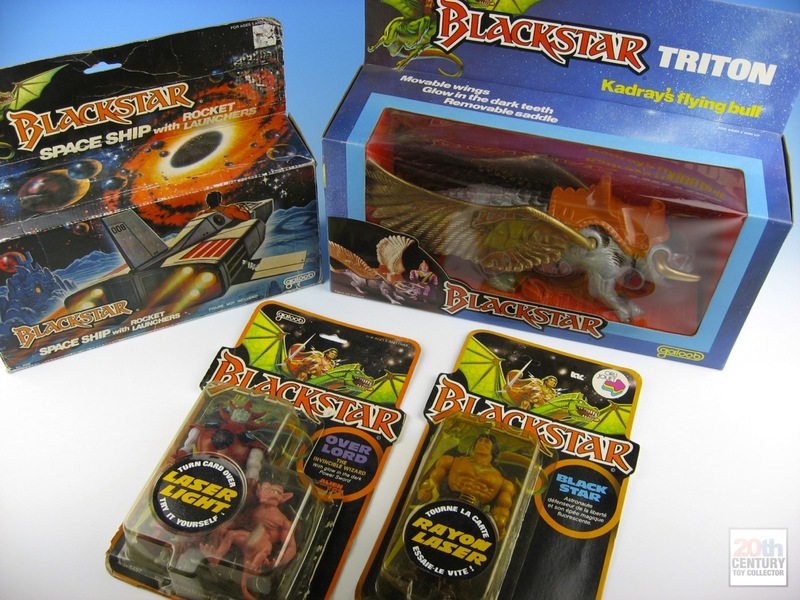 Blackstar was a toy line that debuted in the US in 1983. It was based on a cartoon series created by animation studio Filmation, which premiered two years earlier (in 1981) on American network CBS. The Blackstar cartoon also started airing in some European countries from the fall of 1985 through satellite broadcaster Sky Channel. I loved the Blackstar cartoon. It was a lot like the He-Man cartoon, but somehow darker and more mystical! I never even knew a Blackstar toy line ever existed until much later in my adult life. 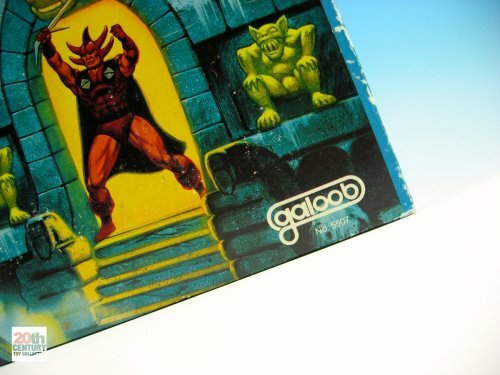 When I learned of the toy line’s existence I was blown away by the awesome design of the packaging and realized straight away I would want to collect those! Over the past couple of years I’ve added quite a few Blackstar action figures to my collection along with some cool “vehicles” like Triton and Blackstar’s Space Ship. I never really actively pursued any of these items, but picked them up here and there whenever they crossed my path and when the price was right. 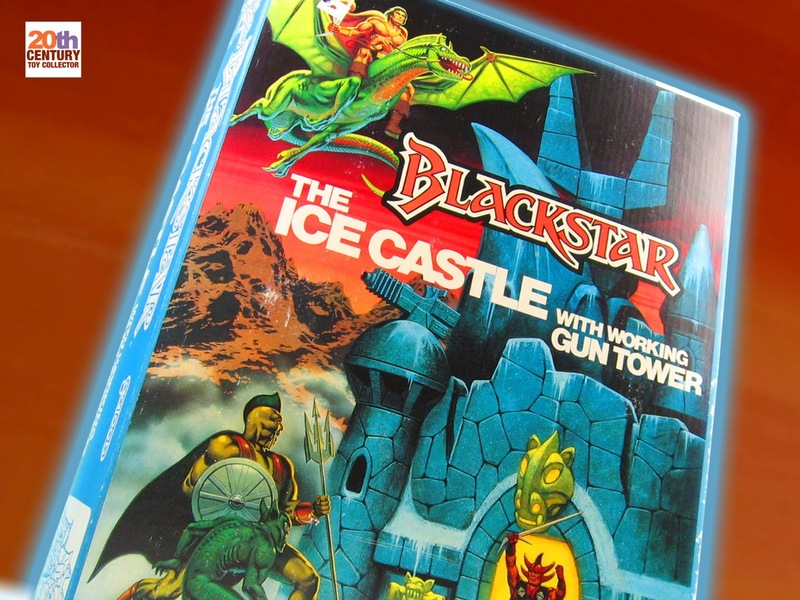 Of all the items in the Blackstar toy line, the gigantic Ice Castle is really the most fascinating one. 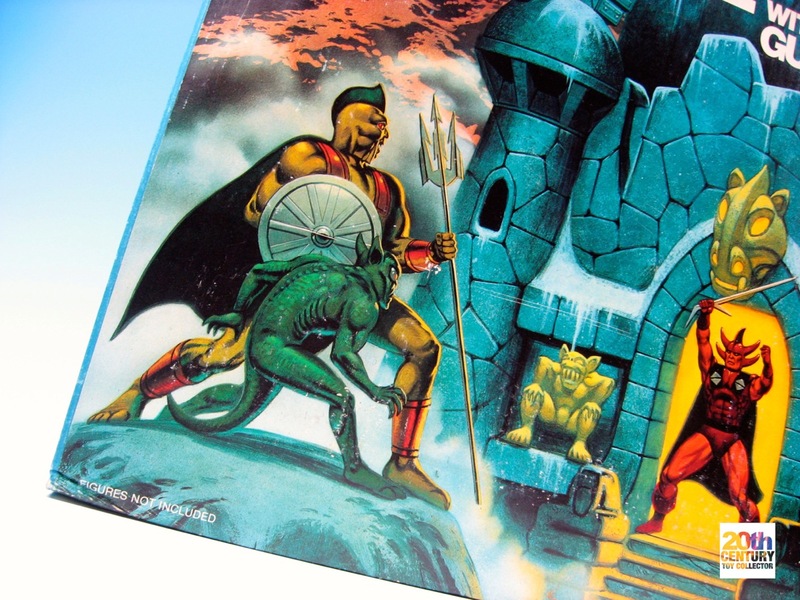 It’s just a drop dead awesome playset and has some of the coolest 1980′s toy packaging artwork I’ve ever seen. It is also one of the hardest to track down inside its original packaging, complete and undamaged. I certainly did not expect to find one any time soon and at an affordable price at that. I happened to be on vacation in Florida with my girlfriend late last year when I stumbled upon a Blackstar Ice Castle that was for sale back in the Netherlands. One of the reasons I had refrained from from buying an Ice Castle internationally was because of the frailty of the plastic that the Ice Castle is made of. 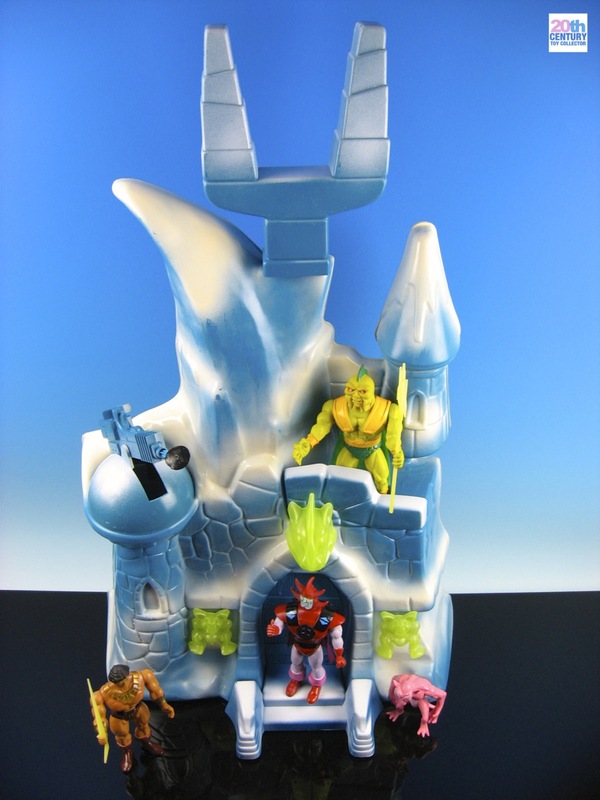 If you were lucky to find an intact Ice Castle online you would run a realistic risk of having it break in transit. The irony was not lost on me. I finally found an Ice Castle in the Netherlands and here I was on vacation in the US, unable to pick it up myself. I decided to risk an overnight domestic shipment and after a few sweaty hours I managed to strike a deal with the seller, which also included a couple of carded Blackstar action figures and a carded G.I. Joe action figure. It felt awesome to finally have bagged this amazing gem! 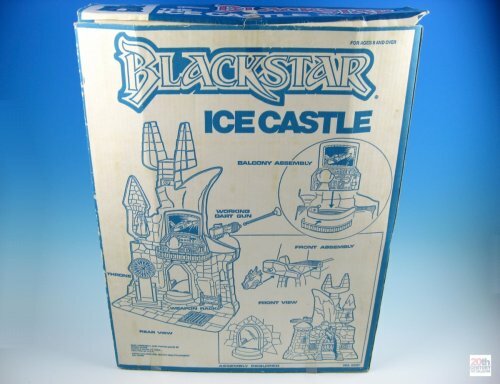 I got a great deal on the castle considering its condition, because the going rate for a Blackstar Ice Castle was probably at least 4 times as much as I paid. When I got back from vacation another couple of sweaty moments followed after I picked up the package from my parents’ house. 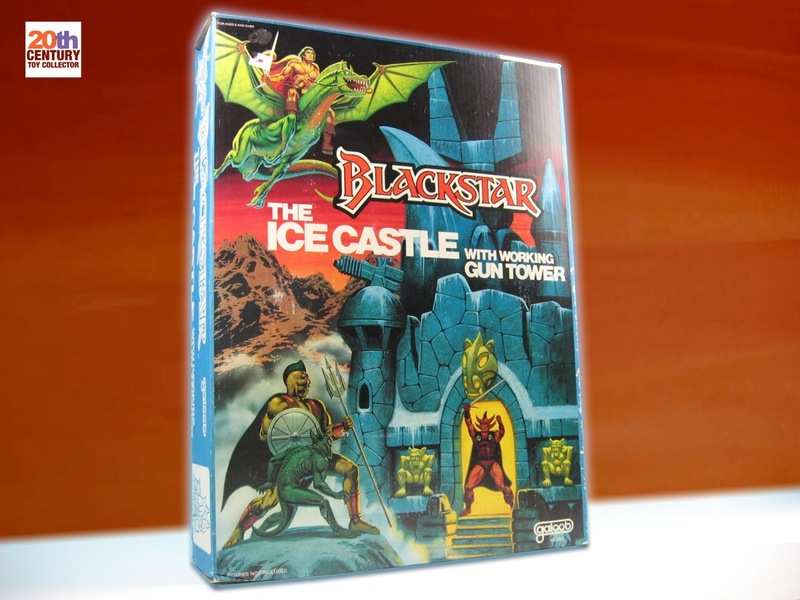 Thankfully the Ice Castle box and its contents were still in unused A-number-1 condition! The box looks so much bigger in real life than I had expected and the artwork is just stunning. We see the Ice Caste depicted against the signature dark orange Blackstar sky in the background with a mountain range surrounded by clouds. We see Overlord at the castle’s entrance waving his Power Sword angrily in the air, while on the far left we see an awesome depiction of Neptul holding his shield and trident, with a goblin next to him. What an amazing scene. I just can’t find enough superlatives to describe how cool this artwork is. Wow. If we turn the box around we can find some simple assembly instructions on the back of the box, including some manufacturing info. 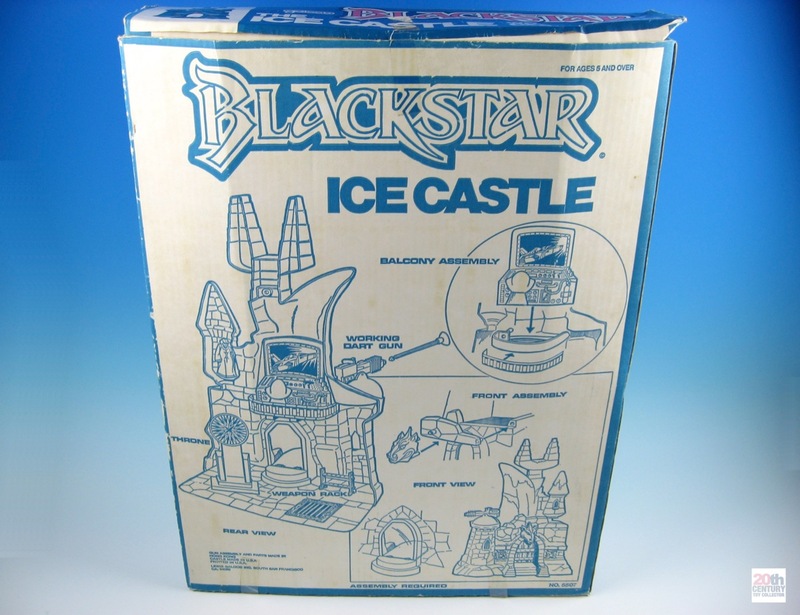 Apparently the Ice Castle was not made entirely in Hong Kong like the rest of the Blackstar toy line. The main body of the castle itself was manufactured in the US, while the remaining smaller parts, including the gun assembly, were manufactured in Hong Kong. 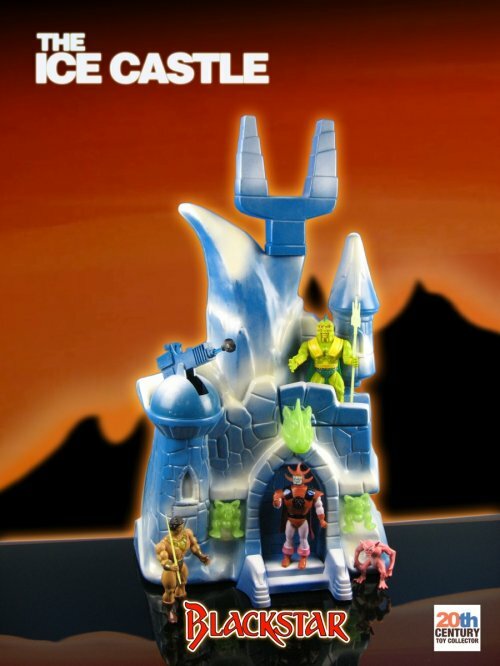 The stock number of the Ice Castle is 5507 as is evident from both the back and the front of the box. 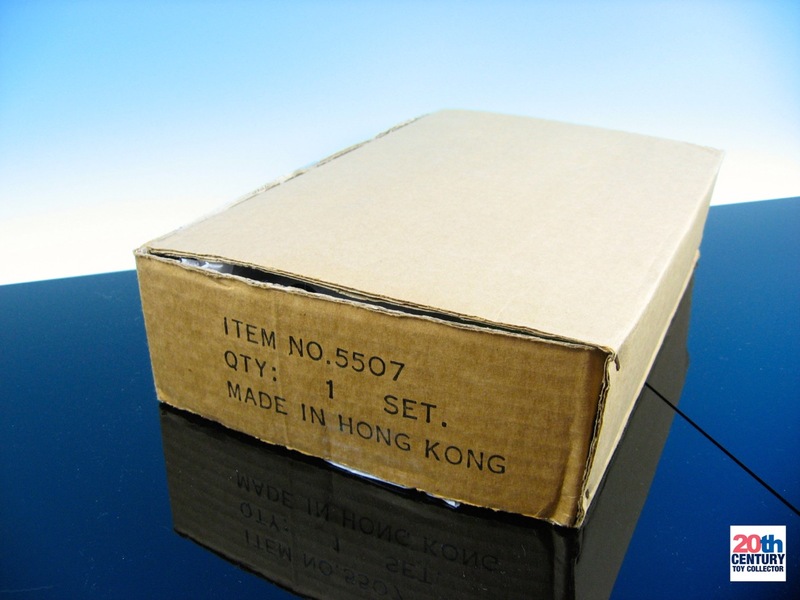 This number is also found on a smaller box inside the packaging, which seems to contain the parts that were manufactured in Hong Kong. Enough of looking at the packaging. Let’s see what’s inside the box and what the assembled castle looks like! So what does it look like in real life? Well, it looks bloody amazing, that’s what! One of the first things you’ll notice if you see one of these in person is just how tall it is. Blackstar action figures are not small to begin with. They’re approximately 14 centimeters tall (5.5 inches), so just imagine how high the Ice Castle towers above them. 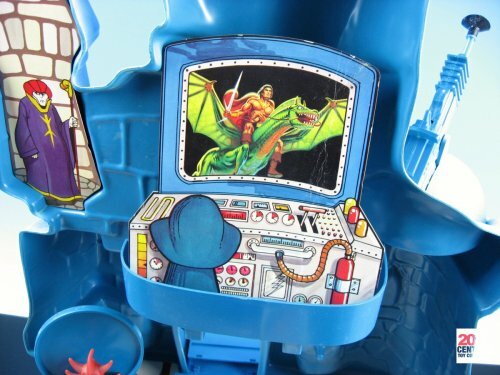 This must have been one awesome playset for any lucky kid who owned one back in the day. The front of the castle looks impressive. It has a working door that functions as the main (and only) entrance to the castle. It is surrounded by three green demons attached to the front of the castle, which glow in the dark! Another key feature of the Ice Castle is the gun tower, which is the tower on the left. The gun assembly uses a spring mechanism to fire an arrow with one of those safety suction cups for a head. I was curious whether the gun assembly would still work. Although the Ice Castle looks like it is completely unused and brand new, you can’t help the fact that this is a toy that is almost 30 years old! Well, I am pleased to say that the gun tower was still alive and kicking. The arrow flew out of the gun like a bat out of hell and landed 3 meters (10 feet) away from the castle! 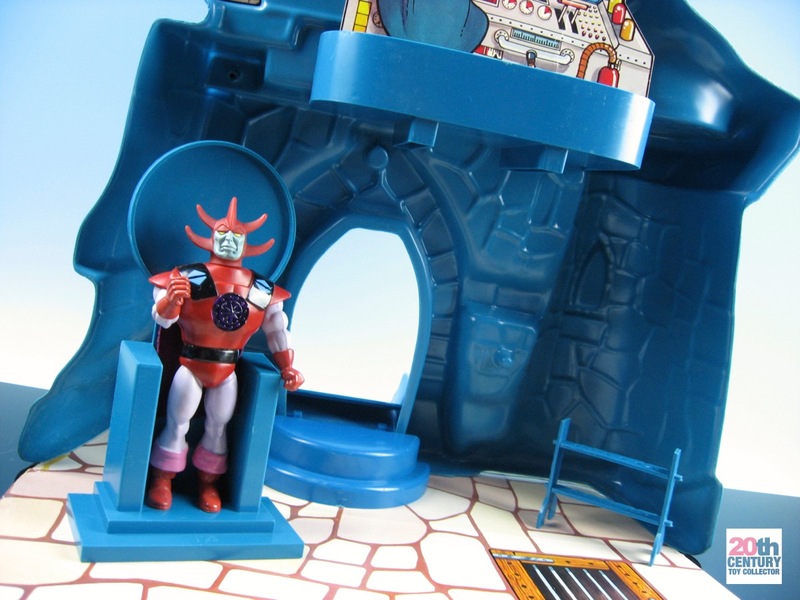 The front of the castle also has a spot right in front of the right tower with space for one action figure. I placed Neptul, Lord of Aquaria here as you can see from the photo below. It only seemed befitting to include Neptul in this little scene, because he adorns the Ice Castle packaging. Now let’s turn the castle around and see what we can find there! As you can see it looks pretty cool from the inside too. I decided not to apply the stickers in order to keep everything as untouched as possible, but you get the basic picture. 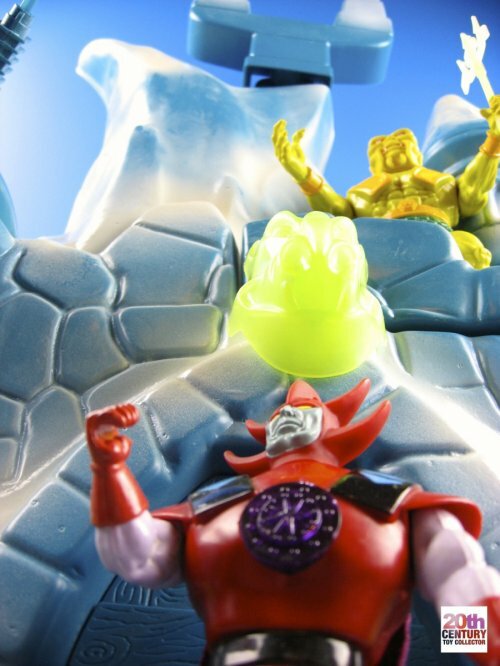 As you can see the Ice Castle comes with a throne for Overlord. It looks kind of weird, because the action figure is supposed to stand inside the throne and not sit, but that’s probably because the Blackstar action figures aren’t really able to sit down without looking totally ridiculous (or break apart) so an understandable move there from Galoob. To the right we can find another accessory, which is the weapon rack. Most of the Blackstar action figure weapons will fit inside this rack, like Neptul’s trident. 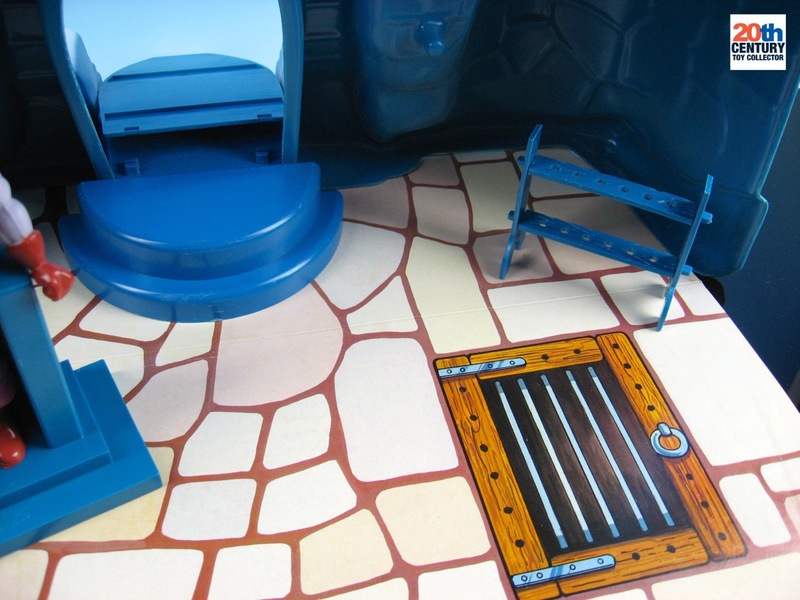 Notice also the very cool floor board that comes with Ice Castle. Next to the weapon rack in the photo below we can see what looks to be some sort of cellar door, no doubt used to hold enemies of the evil Overlord! 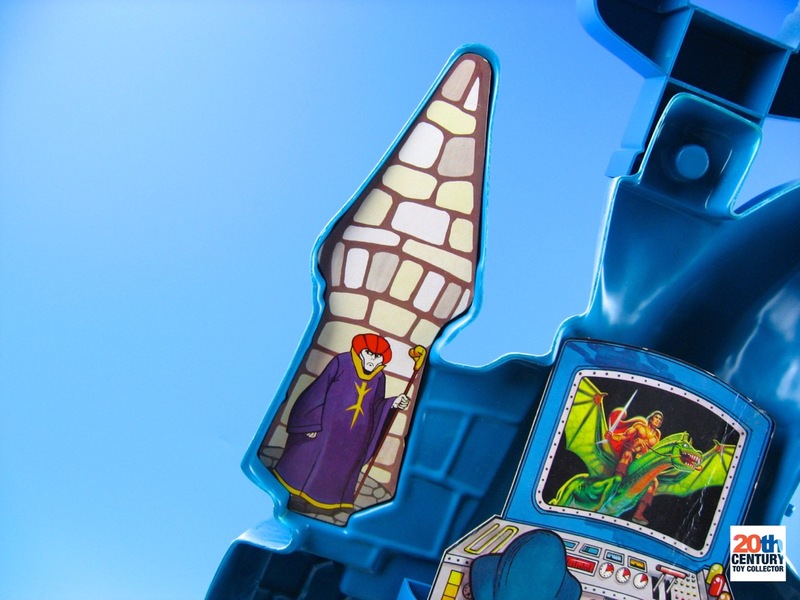 Inside the right tower (shown on the left in the photo below) we can see none other than Overlord’s right hand man Vizir -the evil Ice Castle Wizard- just chilling out the only way he knows how: by looking paranoid. 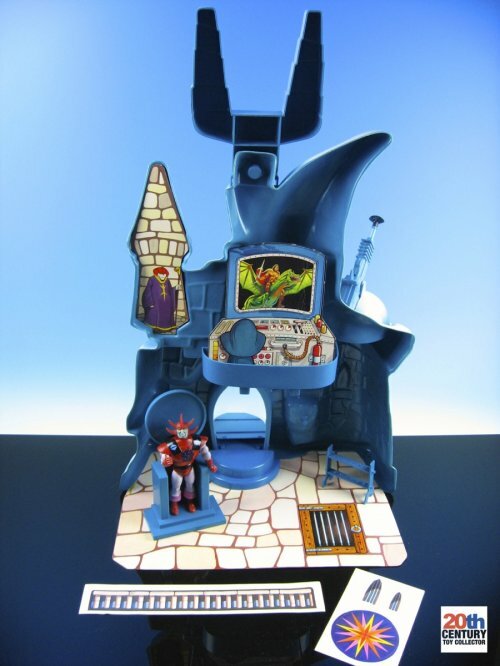 All joking aside, this is one very cool playset and is definitely somewhere in my top 10 list of coolest toys of the 1980′s! This playset embodies what was so frickin’ cool about 1980′s toys. 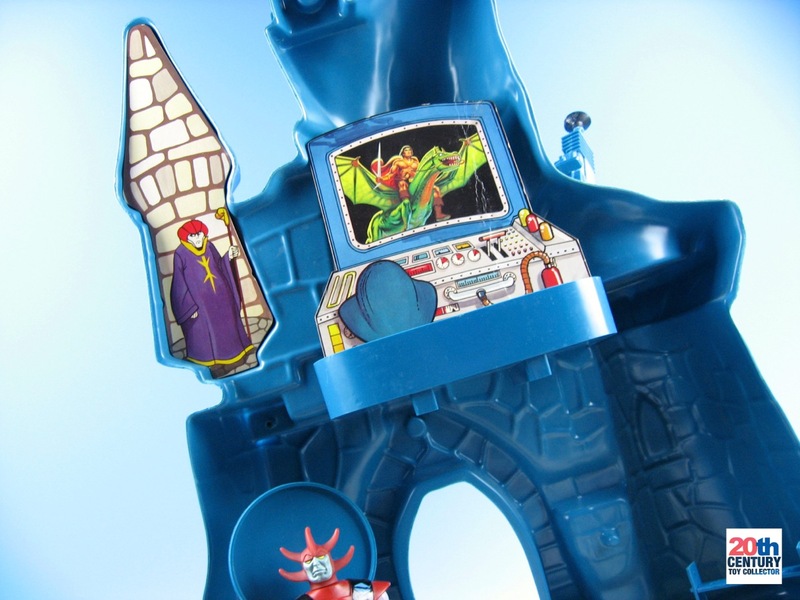 It’s big, it’s cool looking, it’s got lots of ways for the action figures to interact with the playset and best of all, it stimulates imagination! 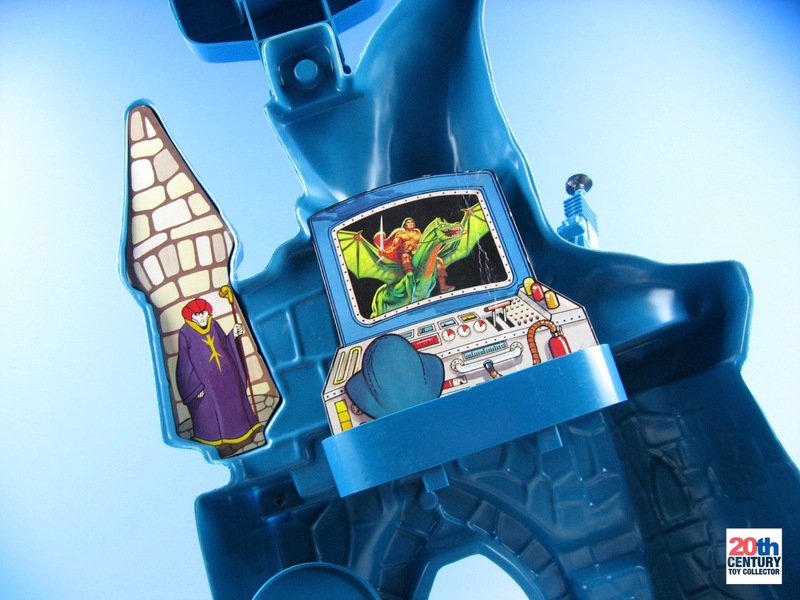 It is without a doubt the coolest item from the Blackstar toy line. You will not regret picking one up if you’re a Blackstar collector. 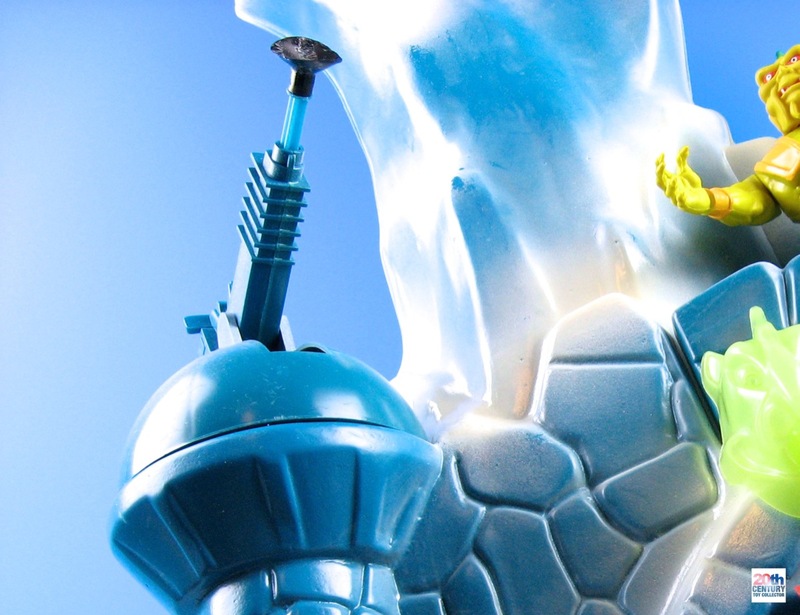 The Ice Castle can be hard to track down, but it’s not impossible to find. Just watch out for any broken parts on the castle itself. Stay tuned for more Blackstar stuff in the near future! I’m working on an article on the wacky way that Blackstar was introduced in the Netherlands, which is going to be a cool read. Have a great weekend! 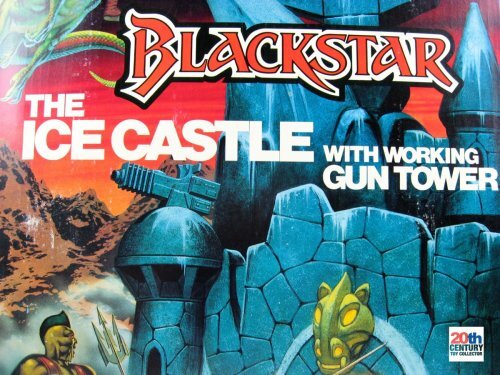 I only remember Blackstar from an ad in the Donald duck. I never knew there was a cartoon. Was this on the Fun factory? I’m very curious to any follow up pieces you will do. The box art is beautiful, a lost art! LOL, that’s funny. 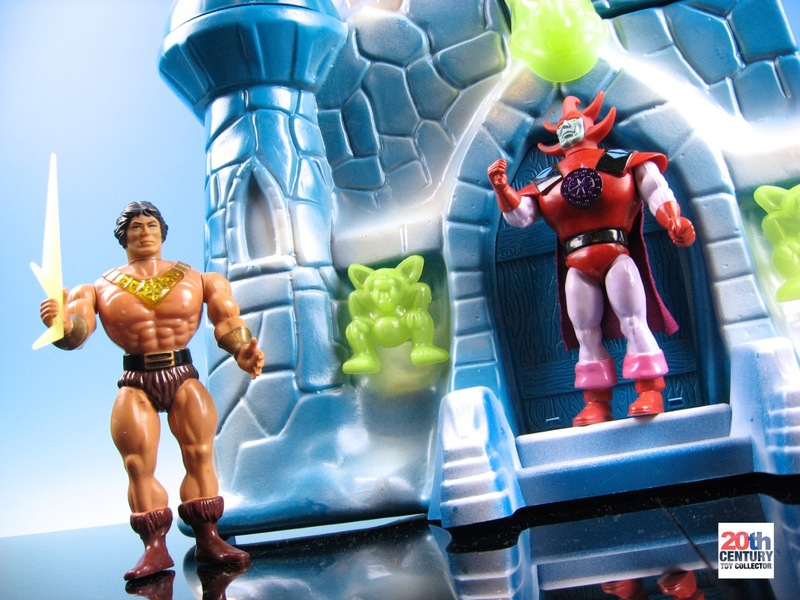 I never knew the toy line existed and you never knew the cartoon existed. :-) It was indeed shown on Fun Factory from October 1985 at 8:30 in the morning (CET). 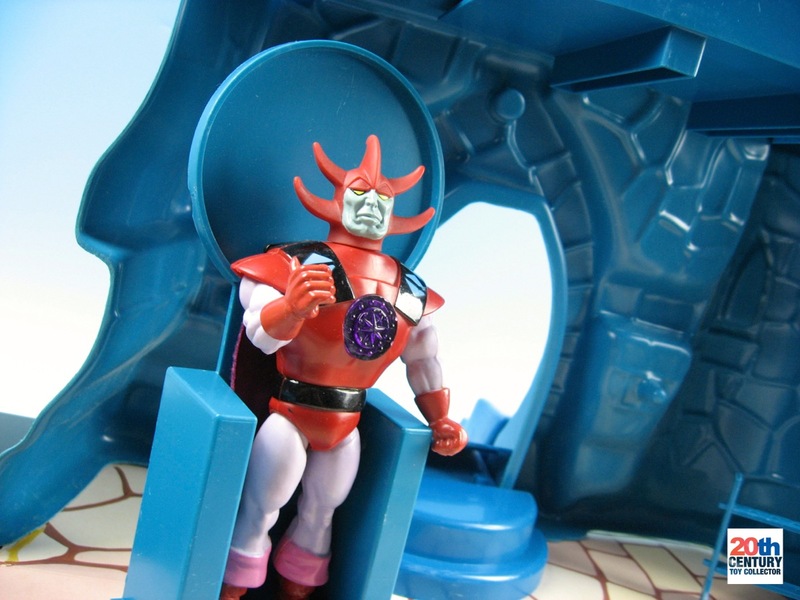 It was sadly only 13 episodes and I don’t think Sky Channel ever re-ran the series on FF or anywhere else, so it would have been very easy to have missed this series completely or to forget about it (after all it was not the same hit as Transformers or Masters of the Universe). I’m glad you agree on the box art. The Space Ship and the Trobbit Wind Machine have equally stunning artwork! I’ve watched some of it on Youtube today and I’m not really sure if I ever saw this or not. I did watch Sky around that period, but perhaps just at the point Blackstar stopped. Amazing how much work they put in this stuff…cartoon, detailed box art, only a comic book is missing. 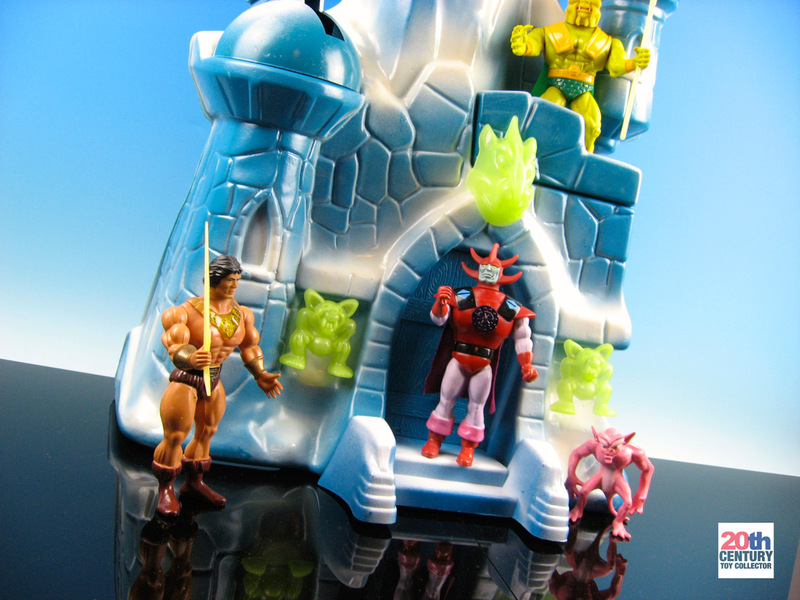 Hey, that was a fantastic article about the ice castle! I’m looking forward to reading your article about the dutch release, because I thought Greece was the only country where Blackstar was introduced in a wacky way! 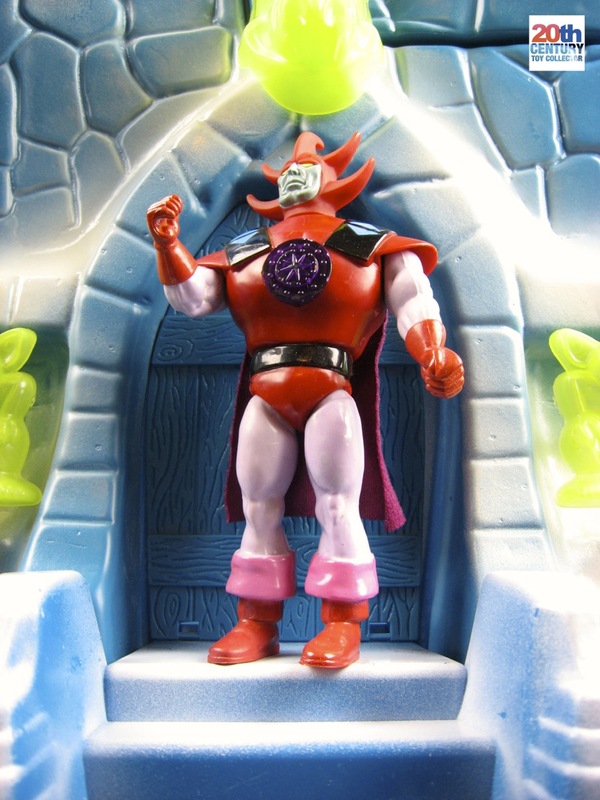 Come over at the return to sagar forum and share your thoughts about this fantastic toyline with us. See you! These were sold only in small amounts, no sure on how many countries, and are hard to find. I have never seen at Ebay. I have Paypal account and will send to all Europe and USA. LMK if could be interested. If can mail me I’ll send you pics. Hi my friend! Excellent presentation! I have the “Ice Castle” too on its Greek version by “El Greco” which is actually…the same! :) My godfather bought this to me when I was 6 years old! I’m missing some stuff as the arrow of the tower gun and the balcony/weapon stands but hey, as you said I was very lucky to own one and play back in the day and above all preserve it as best as I can until my mis 30s. Thanks again. Greetings! 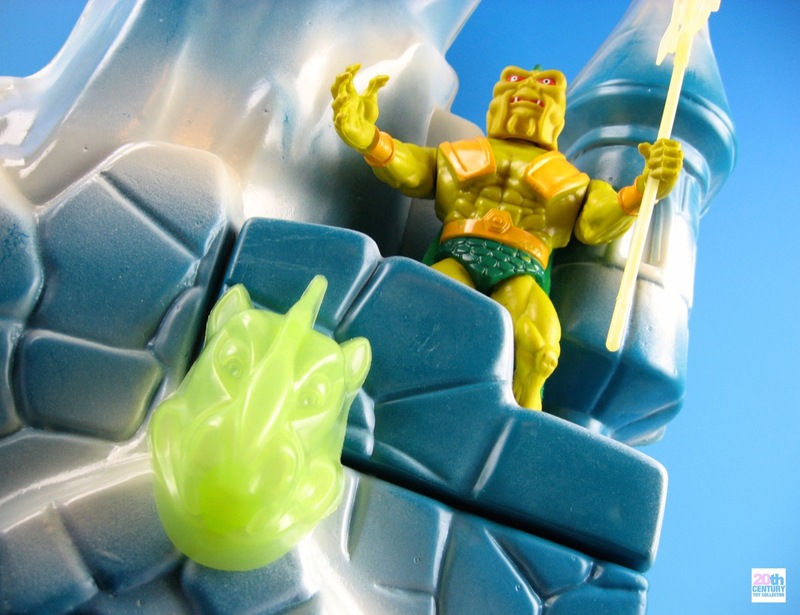 Had the ice palace, overlord, tongo, and several john blackstars. The palace was great. made of rather brittle plastic though. Tongo was a great figure too. Thanks for all the great pictures. I didn’t know this existed either until recently. I have a complete set that I would like to sell can you give me a selling price.